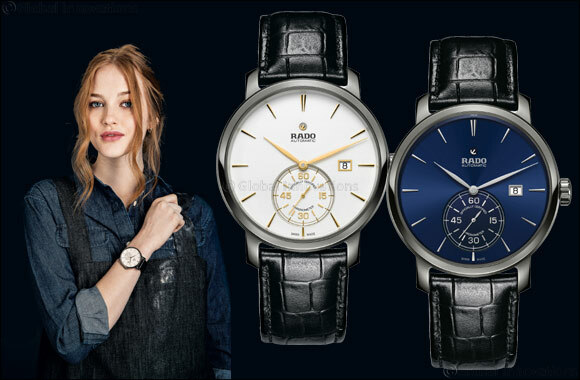 Dubai, UAE, October 09, 2018: Swiss watch brand Rado has long been known for its use of unconventional, high-tech materials and for pioneering their use in the world of watchmaking. In fact, it’s often said that – at Rado – the complication is on the outside. Plasma high-tech ceramic is one such material whose use Rado pioneered and is a form of modern alchemy. The plasma carburising process allows the brand to create scratch-resistant high-tech ceramic with a metallic look without using metal. The colour won’t fade over time. Since it first appeared in 1998, it has become both a mainstay of the collection and inextricably linked with the Rado story - as well as playing a starring role on the case of the new 2018 DiaMaster Petite Seconde Automatic COSC. Only Rado has thought to combine scratch-resistant and durable plasma high-tech ceramic with a material known for its elasticity: silicon. It is this natural, light and hard- wearing material placed at the heart of the new DiaMaster Petite Seconde in the form of the hairspring that has helped this new model achieve its enviable COSC certification for precision. Obtaining COSC certification requires a movement to deviate less than -4/+6 seconds over a 24-hour period, a feat so rare it is only awarded to around 6% of Swiss-made timepieces. The silicon hairspring means the Petite Seconde automatic movement is more impervious to shocks and capable of greater accuracy over time, features essential for maintaining the utmost precision in a world where everyday interference can affect the performance of a watch. Not only is this watch in the top 6% of Swiss timepieces, it is also a watch that is guaranteed to stand out for its classic good looks. Featuring the typical clean, rounded 43 mm DiaMaster case and the open, clear and readable dial the line is know for, this is pure Rado. Topped off with gold coloured detailing and a soft leather crocodile print strap, in 2018 the DiaMaster Petite Seconde Automatic COSC is precisely what watch fans have been waiting for.